Since 2012, the Outbreak has been spreading in different parts of Manila. Our goal is to add a whole new twist to the typical 5km run and give people a a reason to run as if their life depended on it. Not only will you be running against wacky obstacles, you’ll also be running from FLESH EATING ZOMBIES. Dodge our flesh eating, flag grabbing zombies and get ready to RUN FOR YOUR LIFE! Brace yourselves. The Outbreak continues to spread. Learn how it works, what you're up against and what you need to remember to survive! There will be walkers, runners, and even crawlers. But don’t worry, Zombies will not be allowed to make physical contact with runner other than in attempting to pull a health flag. Upon crossing the finish line, you need at least one health flag intact in order to be eligible for prizes. Should you lose all your health flags, you are still allowed to finish the race but you shall be considered "dead" and no longer be eligible for prizes.HIDING OR TUCKING YOUR FLAGS also disqualifies you and gets you automatically infected. If you find yourself out of health flags, you are not considered a zombie and are not allowed to start pulling at other runner’s flags. Costumes are HIGHLY ENCOURAGED. The wackier it is, the better your chance is in winning special prizes from our sponsors. But of course since this is a running event, make sure you can still move in them. This is not a timed event. When you are running for your life, you won't be checking for your time. Getting out alive and surviving is the main objective. Just the same, our routes are generally 5km as we find 10km routes can get too tiring when you are running for your life. Meanwhile for 3km routes... well our zombies just want to chase you longer than that. What type of savages will we be without rules? At the end of the day, underneath all the zombie makeup there is a real human being in there. So any physical contact (punching, kicking, scratching, tackling, spitting, hadukens, flash kicks, etc ) between zombies and runners will strictly not be permitted. Throwing objects of any kind are also not permitted. May it be rocks, branches, sand or even dirt. Just the same, weapons of any kind will not be permitted. (Knives, Shotguns, Pistols, Nerf Guns, BB Guns, Plastic Swords, Pipe Bombs, Molotovs, Shurikens, Light Sabers, etc.) We know zombies are terrifying, but let’s just outrun them and try to get out alive in one piece. Don't taunt the zombies. They had feelings too (once in their previous life). So play nice and just keep running. Remember: the goal is to get out ALIVE. Tripping is quite common when there are hundreds of people running for their lives. In order to ensure order and minimal foot traffic, we will be dividing runners into different time waves. Check out our official wave schedule in this link as a guide. Be there early. We will feed our zombies at the start but they might grow hungry as the day progresses. We recommend you arrive at least 1 hour before your respective wave times to allow time for parking and registration. Though we are unleashing zombies upon you, your safety is still our number 1 priority. We will be having race marshals and medics around the course that will help you in case of emergencies. Even though we are simulating a zombie outbreak, we still expect proper behavior from everyone. For everyone's safety, intoxicated guests will not be allowed to participate in the race. Please arrive to your wave time SOBER. Participants and spectators must abide by all instructions given from the race directors, race staff, volunteers and medical personnel. Violators of these rules will be escorted out of the premises with no refunds. 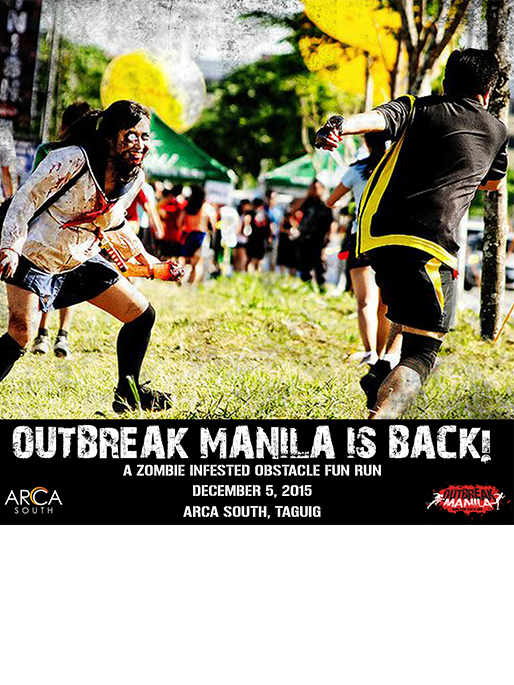 - Outbreak Manila will be on December 5, 2015 from 3pm to 8pm. Click HERE to see the full schedule. - Registration will start on October 31 and will be until December 4, or until all slots are filled up--whichever goes first! - Note that there is a P50 additional fee per person for this payment method. - Still a bit wary of online transactions? That's ok. We can do it the old fashioned bank deposit way. Send us an email at support@outbreakmanila.com with the email SUBJECT: OUTBREAK MANILA WAVE RESERVATION. - Please let us know HOW MANY you are in the group and indicate 3-5 preferred wave timeslot options. Regardless of which method you choose, head over here to our registration page to see our official schedule. In the registration site, you will be selecting between the different wave times on the day. Please note that this just dictates the different start times we will be having and not how long the whole experience will be. Each wave will have a 15 minute interval between one another, but your experience may last from 30-60 minutes depending on how fast you run. Avail of our early bird rates at only P800 per head before November 10. Regular rates are at P900 per personfrom November 11 - December 4. The registration kit includes an Outbreak Manila T-Shirt, runner wrist tags, and collectable dog tags for all survivors (those who finish with atleast 1 life flag). Can kids join? Is there an age minimum? What time is the event? What is a "wave time"? The first wave starts at 3pm, and the last wave is at 8pm. For runners, please be there at least 1 hour before your race wave to give time for parking and registration. A wave time is our way to ensure your safety by avoiding heavy foot traffic when you start your run. You already have a lot of things to worry about, tripping on the feet of your fellow runners is the last thing you want to worry about. How do I get to Arca South? What do I need to bring on the event day? Upon registration either through online or bank deposit, you should receive an email confirmation from our time. Present this along with a valid ID to be able to check-in on the day of the event. Should you not receive a confirmation email, please email us at support@outbreakmanila.com immediately. Don't forget to check your SPAM folders though! If you registered through walk-in, you would have gotten a registration form. Do not lose this! Eat, sleep, and bathe with it if needed! No registration form = No entry on the day. This is a rain or shine event. Let’s face it, when there is a zombie outbreak happening, a little rain is the least of our worries. But should there be severe weather conditions, it will be for everyone’s best interest that the event be rescheduled to a later date. Outbreak Manila lets your zombie nightmare / dream come to life! You will find yourself right in the thick of things but your safety is always our number one priority. Can I bring weapons or a shield to protect us? You can bring a plant as long as it does not shoot out peas or gobbles up zombies. Aside from those, WEAPONS OF ANY KIND (be it water guns, nerf guns, socks with marshmallows inside, baseball bats, rocks) will not be allowed inside the course. Should the marshals catch you carrying one, you shall be immediately disqualified and escorted out of the course with no refunds. Remember, the goal here is to RUN. When all else fails, don't think. Just RUN. If I run out of flags in the middle of the course, can I become a zombie and start pulling other people's lives? If during the course of the race you find yourself out of health flags, you are not allowed to start grabbing other runners flags and growl like a mindless zombie. Our other zombies will think you're weird. Get a life some other place and stick to finishing the race "dead." . How can I be a zombie? You'll have to submit the requirements of our Zombie School scheduled for November 21, 2015 and graduate the class with flying colors! Check out the section below for zombie school requirements. Enrollment to Zombie School is now open! - Send an email to support@outbreakmanila.com with complete name, age, and a very good reason on why you want to become a zombie. This method will have a P1000 peso enrollment fee. 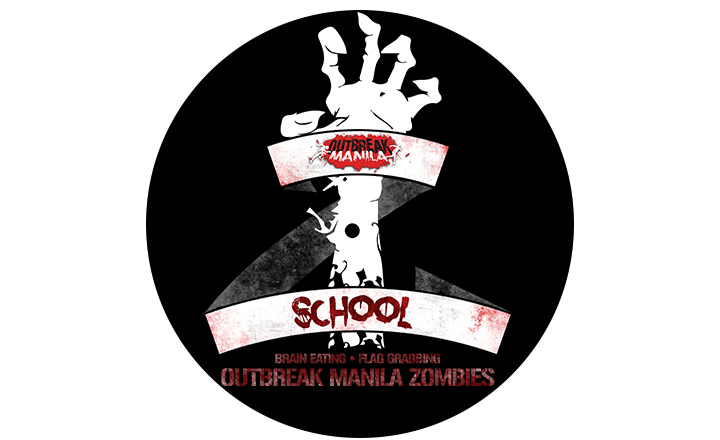 But it comes inclusive of meals during zombie school, zombie makeup on the day of the event, and a cool Outbreak Manila Zombie T-shirt. - If you want to apply as a scholar and still get the perks above, you will have to submit a video to our email of your best zombie impersonation, complete with costume, makeup, and zombie actions. It may sound silly to do, but if you are still reading this, it means you're willing and interested in doing this in front of thousands of runners anyway so might as well practice now. - Willing to follow all of our rules. What type of savages will we be without rules? WHAT KIND OF SAVAGES WOULD WE BE WITHOUT RULES? - Any intoxicated zombies will not be allowed to participate and will not receive any of the zombie perks. - There will be Zombie Group Leaders. Pay attention to his/her instructions. What type of savages would we be without a leader? If you have questions or if you are interested in partnering with us, send us an email at support@outbreakmanila.com and let’s make this happen! Until then, be sure to stay updated in our social media community.